"The Miracle Physician 神医 (shén yī)"
His name has become synonymous with "Miracle Doctor" as he cured many strange sicknesses. Studies by historians said his medical techniques were hundreds of years ahead of his time. The Romance of Three Kingdoms story, however, deviates from history slightly and almost turns him into Super Doctor. Two prominent scenes showcase Hua Tuo's incredible healing powers: the first is his surgery on Guan Yu 关羽's arm and the second is his proposal to cure Cao Cao 曹操 of his migraine. Both of these scenarios will be described later in the "Additional info" section. Though his appearance in the story is brief, he carries significant impact. This effect is felt when Cao Cao regrets the death of Hua Tuo as his own son, Cao Chong 曹冲, becomes gravely ill. Without Hua Tuo's medical expertise, Cao Chong did not survive the illness. Character ability 1: "First Aid 急救 (jí jiù)"
Outside of your turn, you can use a red-suited card as PEACH 桃. 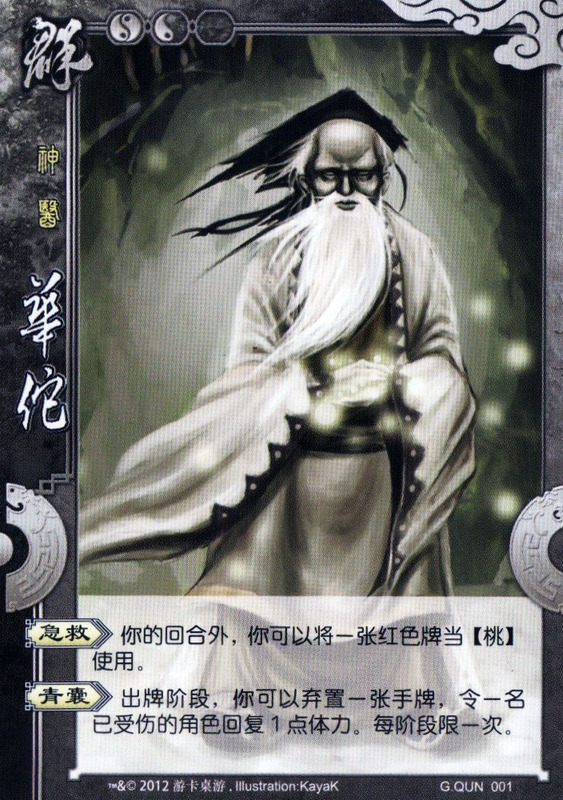 Character ability 2: "Green Salve 青囊 (qīng náng)"
During your action phase, you can discard an on-hand card to cause a player to regain 1 unit of health. Limited to once per phase. "First Aid" could have some connection with him saving Guan Yu from the poison arrow. Though Guan Yu wasn't exactly on his deathbed yet, the wound was life-threatening and Hua Tuo did save him. "Green Salve", on the other hand, is very much linked to the story. Hua Tuo had with him a book of his works known as the "Book of the Green Salve 青囊书". This book contained numerous medical techniques of saving lives, but was destroyed when he died. Though not told in the story, the historical accounts mention that this book was burnt by Hua Tuo himself when the prison guard refused to accept it.